MONDAY, Oct. 26, 2015 (HealthDay News) -- There is no need to ban tackling from youth football, but players need the right training and supervision to cut their odds of injury, new guidelines from a leading group of pediatricians state. In the policy statement, the American Academy of Pediatrics (AAP) says young players need to learn proper tackling techniques and, whenever possible, have guidance from certified athletic trainers at practices and games. The group also suggests kids be given more opportunities to play flag football and other tackle-free variants of the game. Dr. Greg Landry, one of two lead authors of the policy statement, presented the new recommendations Sunday at the academy's annual meeting, in Washington, D.C. They will also be published in the November issue of Pediatrics. This is the first time the group has come out with a policy directed specifically at tackling in youth football, said Landry, who specializes in pediatric sports medicine at the University of Wisconsin, in Madison. The policy statement was spurred by growing concerns over the potential consequences of sports-related concussions in young athletes -- with football getting much of the attention. Much of the worry, Landry said, has stemmed from cases in which former professional football players have suffered long-term problems such as Parkinson-like symptoms, mood disorders, and memory and thinking deficits. Autopsies from some of those athletes have revealed evidence of widespread brain damage that has come to be known as chronic traumatic encephalopathy (CTE). The theory, Landry said, is that CTE develops from repeated blows to the head, whether they cause a concussion or not. But, he added, the causes are still unclear and researchers are not sure that CTE accounts for the symptoms some pro players have suffered. What's more, no one knows whether kids who play football might suffer any lasting brain damage from knocks to the head -- including those with enough impact to cause concussion symptoms. To be sure, Landry said, young players' concussions should be taken seriously and allowed to heal completely before they return to any physical activity. But in the AAP's research review, "we found no evidence that tackling should be banned from youth football," Landry said. Instead, the group stresses the importance of teaching young players proper tackling techniques. It also says existing rules against dangerous, head-first tackles need to be strongly enforced. Although those kinds of hits have long been banned, there's still a "culture of tolerance" for it, according to the academy. Mary Beth Horodyski, vice-president of the National Athletic Trainers' Association, agreed. "We need to change the culture from, 'Wow, that was a great hit,'" Horodyski said. "We need to recognize when it's not a 'great' hit, but a borderline-illegal one." Another key step, according to the academy, is to have athletic trainers on the field during games and practice. Athletic trainers are educated in preventing, diagnosing and rehabilitating injuries, and studies suggest their presence cuts players' injury risk. "We realize that communities and schools may not have the resources to hire an athletic trainer, especially full-time," Landry said. "But whenever possible, have them present." According to Horodyski, athletic trainers can also help make another academy recommendation a reality: The group says young players should perform exercises to strengthen the muscles supporting the neck -- which, some evidence suggests, could lower their concussion risk. To perform those exercises safely and effectively, Horodyski said, kids need guidance from adults with the expertise. "That's not to knock on coaches," she added. "But they don't have the education in proper strength-training technique, or what exercises are appropriate for players' [physical] maturity level." Horodyski suggested that parents of young football players take a look around during practices and games. "If you don't see a health professional on the field, ask why," she said. At the same time, she and Landry both stressed that the risk of severe injury in youth football is low. 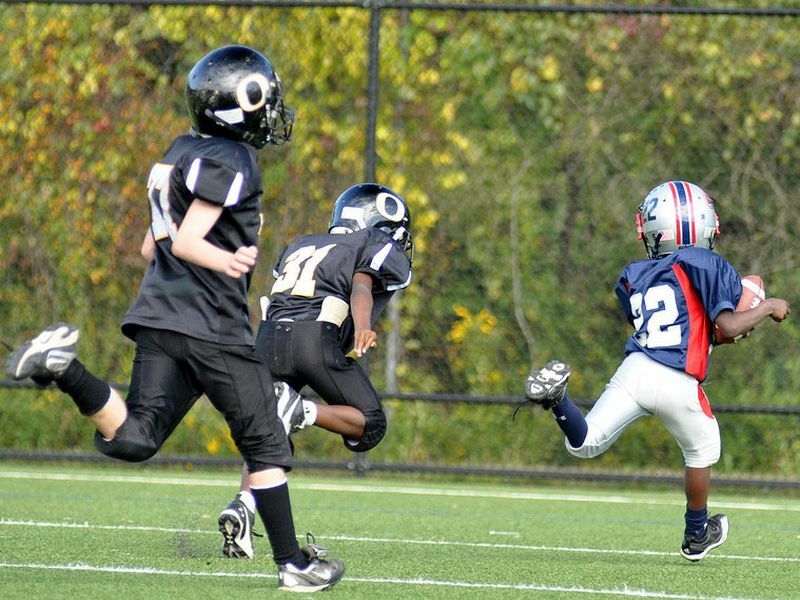 Roughly 250,000 youths, aged 5 to 15, play tackle football in the United States, according to the statement. Injuries to the head or neck account for anywhere from 5 percent to 13 percent of all football injuries, according to the academy. And "catastrophic" injuries to the brain or spinal cord strike up to 0.002 percent of young players each year -- a rate comparable to gymnasts', the academy said. So parents should balance the risks against the benefits kids can gain from playing sports, according to Horodyski. "Playing sports is a positive outlet for kids," she said. "The AAP policy recognizes that." And for kids who like the game, but not the tackling, flag or tag football are good alternatives, Landry said. Schools and communities should offer more organized opportunities for that, he added.